NOTE: This page is archived for historical purposes and is no longer being maintained or updated. Contact NIOSH Mining if you need an accessible version. This report contains a description of the contract activities performed by ENSCO, Inc. under contract No. HO178069. The purpose of this project was to enhance the Bureau of Mine's Cableless Electronic Survey System use to aid in the drilling of long boreholes in coal as part of the methane drainage program. 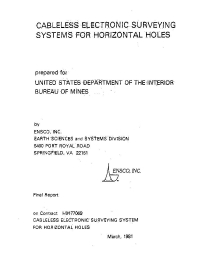 The system that was ultimately developed was field tested and demonstrated in actual in-mine drilling activities. The significance of the system, compared with previous drill survey systems, is that it surveys without having to be inserted and removed for each survey point. The system is so designed that it can withstand the shock and vibration experienced by the drill string during drilling. Thus increased productivity is possible and drill operators can determine drill bit positioning in a near real-time environment.